I have a tradition with my friends that I started sixteen years ago (I can’t believe it’s that long ago, someone really did hit the fast forward button on my clock), and I’m happy to report that it’s still going strong! It’s one of my favorite days of the year. And now, even when some of our friends have to fly in for the occasion, we always make it work. And it is exactly what it sounds like, a Friend’s Thanksgiving! When I first moved to the East Coast, I left my rather large family (some 60 odd cousins) and moved to the big city where I didn’t know anyone. As my friendships started to grow, those friends became my family. I realized how lucky I was to have them. All of us were transplants, having moved from some other part of the country. So, we started to rely on each other as our “other” family. This tradition of Friend’s Thanksgiving started one year when three of us couldn’t afford to fly home for the holiday. As someone who loves to cook, I decided to buy a turkey and make us a traditional Thanksgiving dinner! I lived in a studio apartment on the Upper East Side of Manhattan. The kitchen (and by kitchen I mean the 2×2 linoleum covered box were someone put a miniature range) was so small that I had to cube the bread for the stuffing in phases. Dressing the turkey was quite the chore as there was barely enough room for me and the turkey in the same space. Whipping the cream for the pie and mashing the potatoes were my favorite parts of the preparation because I could stand in one place. I had what I like to call an “Annie Hall” moment on Thanksgiving morning as I attempted to put the turkey in the oven and realized that it wasn’t going to fit. I spent a great deal of that day leaning on the oven door so it would stay closed. I wish I had taken a picture! I’m happy to report that it took a little bit longer than I had planned, but the turkey was cooked through. The three of us sat on my living room floor, shared photos and laughed about how great it was to actually eat a real Thanksgiving dinner while being so far away from our families. We had such a great time that I did it again the next year, for a few more friends. And the year after that it grew even more. It’s grown every year since. As time went on, many of us got married, some of us have had children and all of us have moved. So we couldn’t celebrate Friend’s Thanksgiving on Thanksgiving Day proper anymore. Instead, about four years ago, I chose the Friday before Thanksgiving to celebrate our friendship. It’s now officially a holiday on our calendars. I love the days of preparation. The night before I bake the pumpkin pie, the apple pie and I make the stuffing so I can stuff the turkey Friday morning. I always have my favorite CD playing after the kids go to bed and I start peeling the apples. There’s nothing like it. It’s become one of my favorite holiday traditions every year — for me, it’s the signal that the holidays are really and truly here. And as I cut little apples into the pastry dough for the apple pie, I smile to myself as I remember that first Friend’s Thanksgiving when my little oven was so small that I had to cook the turkey with the oven door open. Friday morning I stuff the turkey and put it in around 10:00am. I don’t have to do much else in the kitchen except baste the turkey until about 4:00pm, so I spend the day cleaning the house, moving the couches out of the living room and bringing in a large second dinning table so everyone can fit. It takes two sets of dishes and an extra set of silverware (always provided by one of my husband’s best friends) to make sure everyone has a place. As I iron the tablecloths and arrange the place settings, I imagine the conversations that will take place that night and I go over my list of preparation over and over again as I’m always afraid I’ll forget something! I love every minute of it. These days, my kitchen is much bigger, my cookware is nicer, but the tradition and the feeling is exactly the same. 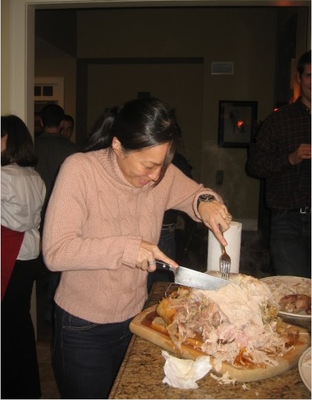 You can see here, my friend Michele is carving the turkey while I finish up the gravy. There are many more people in the kitchen wanting to help, laugh and eat. It’s a wonderful time to remember the people that make my life wonderful all year. The food I make for them is an absolute expression of that gratitude. I wanted to share this tradition in the hope that other moms will want to start their own traditions, but also to remind us all how important our friends are during this season of thanks. Finally, I love to share my recipes too! Below is the menu for Friend’s Thanksgiving, it’s what we’ve all come to expect! Myself included! For full recipes and more tips, check out Quick Tips for Thanksgiving. From our kitchen to yours, have a wonderful Thanksgiving!